With no moon in sight the sky is as black as I've ever seen it. "Sackcloth" is the apocalyptic term that my Southern Baptist mind conjures. I live in a remote region of the Texas Panhandle and must concede that the nights here in southwest Texas are as impressive as I've seen. We are 80 road miles from the closest town and the weak lights of the small cities in the distance offer no match to the overpowering darkness of a Chihuahuan Desert night. Millions of stars dot the sky overhead. The minor stars are so bright that finding constellations is somewhat difficult; however, we try. I'm in camp with three friends as we recline in our lawn chairs and ruminate about life's goings-on. I relish the others’ wisdom. My brother Bubba and a couple of friends from Childress are with me. 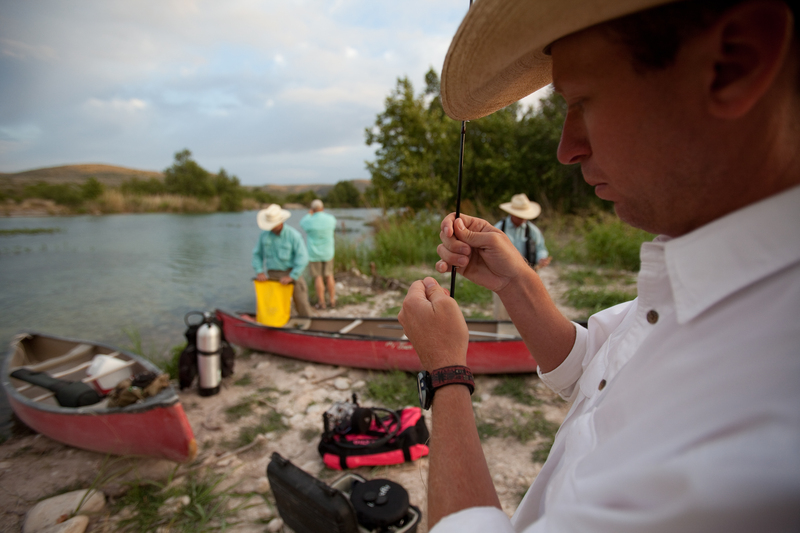 A few hours earlier, we made the 300-plus-mile drive from Childress to fish the fabled Devils River. We sit and talk about the next morning’s adventure while watching lightning dance in the distance. Time and again, the conversation turns to the river's rapids. Just before sunset, we'd visited the river and fished a bit on a narrow strip of frontage on the state-owned property. We feel lucky to be on the stretch of river because the Devils is notorious for lacking public access. In doing pre-trip research, I found the stories of unwelcoming landowners and elusive public access a bit daunting. So much so, we tried to convince ourselves to float another, more accessible river like the Guadalupe or Llano but the lure of wild country and a wilder river proved too strong. A few hours before sunrise we make a long and arduous trek from our cabin down a rough and rocky road to the river's edge. On the way, we ford creeks swollen with swift waters from recent rains. The country is so rocky, flash flooding is a danger in the area because almost all the water that falls in the river basin is runoff and flows quickly while making its way to the Devils and eventually to the Rio Grande. Upon seeing the river, we delight in her sheer beauty. The deep jade water flows through rugged karst which filters sediments before bubbling up through the numerous springs that line the river's banks. We stop first to explore a huge spring that flows cold, clear water into the river at a rate that is incomprehensible. 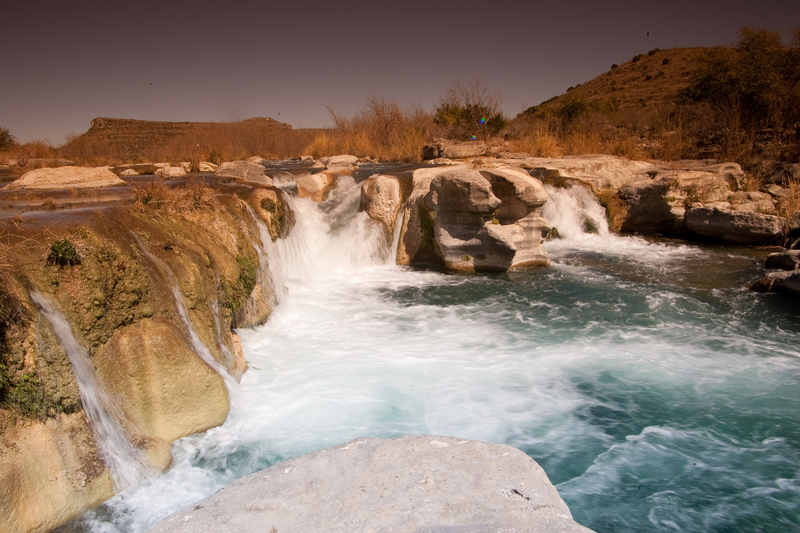 I am told that the spring flows from the exact rock seam that separates the Edwards Plateau from the Chihuahuan Desert. I can’t confirm it, but the idea makes for cool conversation. Ceremoniously, each one of us stoops to drink as if to christen ourselves in the holy Hill Country water. Walking away from the spring we look at the water flowing past and begin to see fish darting about as if we weren't there. Mostly, though, we admire the river's beauty and ponder the hellish rush of water that we hear a half-mile downstream. We want to explore the noise, but signs everywhere declare that the land downriver is privately owned. Walking down there along the banks would mean trespassing, and we dare not ruin our trip for mere curiosity. So, the sound must wait for exploration by canoe. This marks the fifth time I’ve floated this stretch of river and so far, the newness hasn’t worn off. I don’t know if it’s the solitude that brings me back or the sheer beautiful harmony between the water and the rocks. Perhaps it’s the fishing or the paddling. I think it is simply all of it together— Texas the way Texas used to be. 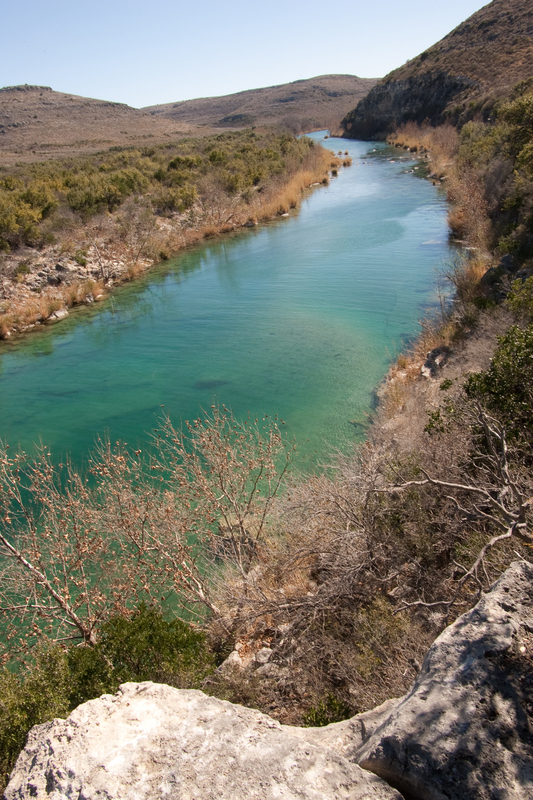 For rancher Ruthie Russell, a TWA Life Member, this is the way the Devils River should remain. Russell, along with her family, owns the 7,700-acre Sycamore Canyon Ranch. It’s an expansive piece of desert property that borders three miles of the Devils River. Like other private landowners, Russell and her clan protect their property and hence the river in earnest. She placed her ranch under a conservation easement with the Texas Agricultural Land Trust or TALT. Russell explains to me that Texas loses more land to fragmentation each year than any other state. “We all have nightmares about the land getting chopped up all over the state. I mean it's just horrible cancer that's happening all over. We are lucky enough to own land and the least we can do is try to protect it,” she says. As we talk, she speaks of the Devils with reverence and respect, and the conversation soon turns to the most imminent danger to the river and the open spaces that surround it: wind farms. Recently, a Chinese entrepreneur bought more than 100,000 acres in Val Verde County to develop wind farms. With federal subsidies and a push to create more energy from renewable sources, Texas has seen a boom in wind farm construction. Steady wind, relatively inexpensive land, and a limited regulatory environment make much of Texas’ open spaces easy targets for wind developers. When the projects were announced west of Russell’s ranch, she and many others in Val Verde County dug in their heels. Once we slip into Old Towne canoes, we spend a few minutes orienting our gear and getting our fishing equipment ready. We each tie on an olive-colored woolly booger. Ten minutes ... It takes us 10 minutes to float downstream far enough to see the river change angles. Instead of flat and placid, the river begins to run briskly downhill. The faster the river runs, the faster my heart beats. Deep in a cane thicket, Bubba and I can't tell where we're going but we know we are going somewhere. The ride through the cane is a bit disorienting because the river’s sensory assault. The sound of the waterfall is omnipresent. Trucking through the cane, the vertical, deep green stanchions rush by at in a blur of green, nearly inducing hypnotic vertigo. Intermittent splashes of cold water insure we stay lucid and focus on our trip, while the smell of rotting vegetation erupts and revives us every time we stick a paddle in the black muck where the cane grows. At the end of a long stretch of rapids, we stop and regain our bearings. Bubba and I stop first. In a minute or so, the others catch up. We've made a pact to stay together. As seasoned outdoorsmen, we know safety comes in numbers, so we keep each other in sight. We stare for a minute at the long stretch of skinny water that runs over rounded stones. Taking safety into consideration, we portage our canoes for the next couple hundred yards and avoid the strong current altogether. This early on the trip there's no point in risking losing our gear or injury, so we play it safe. Before we head too far down river, though, we take time to get to know Dolan Falls. 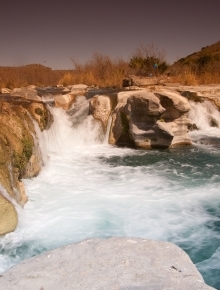 The signs that point out Dolan Falls tell us that the surrounding land belongs to the Texas Nature Conservancy. 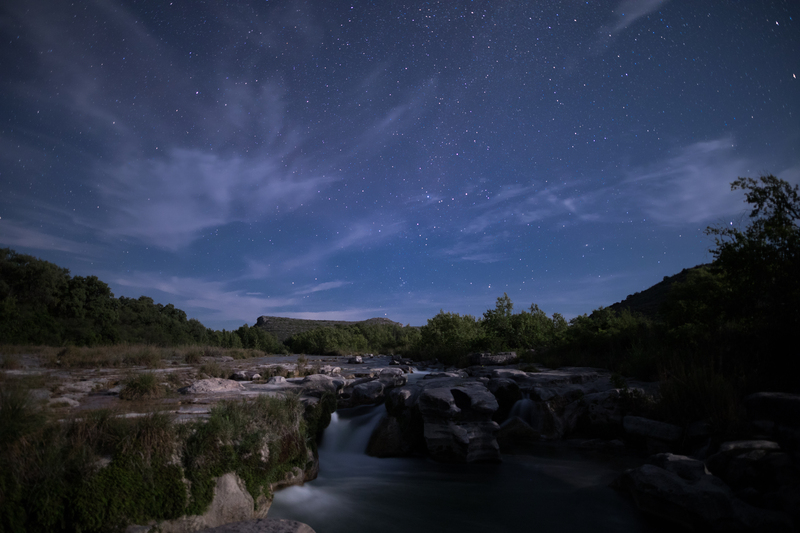 It also reminds us that due to the fragility of the most unspoiled riparian region in Texas, we should appreciate the waterfall for just a few minutes and move on. The river above the waterfall seems oddly disconnected from the river below the falls. I've never seen any big waterfalls before much less in Texas, so I ponder at how extremely the river falls off. Flanking the deluge, I make my way to where I can look into the falls’ mouth. I never realized such a beautiful water feature existed in Texas. I stand in awe. My photographer’s instincts take over and I shoot pictures. Not wanting to wear out our welcome at the site, Bubba and I head to the waterfall’s other side. Loading our gear, we pull our canoe back upstream and cross in some shallow riffle rapids, carefully avoiding the deeper, more treacherous water that could sweep us over the falls. Bubba and I soon find out that a long canoe loaded with camera equipment and a day's worth of gear is heavy; big rocks lying at river's edge compound the difficulty of getting around the falls. We push, pull, lift and occasionally cuss, but finally get the canoe below Dolan Falls. Although the overcast sky keeps the June temperatures tolerable, we both sweat heavily. Shoving off from the falls, we are all proud to have what is the first and most formidable obstacle behind us. Although it took some work, we easily made it around the falls. With the falls’ roar fading, it's time to fish. On the river, I’m as alone as I’ve ever felt in Texas. Absolutely no one is around except for those in our party. The river and the fish are wild. 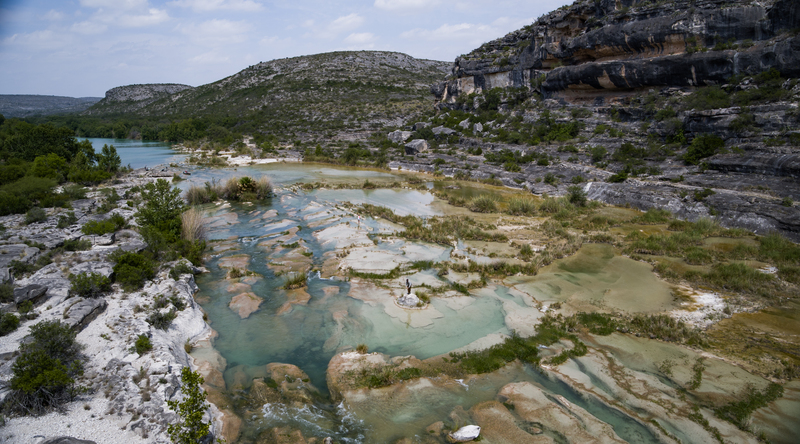 Russell says she is afraid that continued and unabated development of this fragile desert and wetlands will change the Devils River watershed permanently and irreparably. The advocacy group she is aligning with is Val Verde Vistas; the group opposes further wind development in the county and are digging in to try and fight the proposed foreign-owned energy complex. According to the group, Val Verde Vistas “…is its citizens, governments, and organizations of Val Verde County who have joined together to oppose wind farm expansion in the region.” Among the negative impacts of a wind farm complex, the group claims, is that it creates airspace hazards for Air Force pilots in training, sacrifices future generation opportunities for limited short-term benefits to external interests, devalues real estate and creates a hazard for wildlife. Russell says the wind farms threaten to scar the landscape that she and others have worked so hard to protect. She understands the impact that development could have on the desert and water quality in the river that holds the southernmost breeding population of smallmouth bass in North America. She is also afraid how the energy developments could affect tourism for the river and the state-owned lands that flank the riparian area. For the next couple of hours, we alternate negotiating rapids and fishing. Except for a brief respite to eat a river-side lunch of summer sausage and crackers, we spend most of our time progressing downriver. At the trip’s halfway point, we encounter another, albeit smaller, waterfall and swiftly portage around to safer water. Immediately downstream from the waterfall, we stop at a flat with water reminiscent of the Caribbean. Even under overcast skies the water is colorful and glows like a gem when the sun finally breaks through. We park the boats in shallow water on the river's west side and wade a broad, shallow shelf. Near the middle of the river, the shelf drops sharply and holds fish by the dozen. Across the river, a small neck juts back into the bank. Submerged in the neck is an underwater spring that flows tap-clear water into the river. The hole is probably 10 feet deep and 15 feet wide and acts as a natural aquarium. Inside this "aquarium," gar, carp as big as 25 pounds, big catfish and numerous species of unknown baitfish live harmoniously. Although they can escape to the river proper, the fish just hang out in the spring's flow. I snorkel a bit and marvel at how many fish inhabit this river. Eight rough and rugged river miles and nine hours later, we make it to the endpoint. A litany of adjectives describes the way we feel: tired, hungry, proud and satisfied work…for starters. Sleep doesn’t come easy tonight because of our excitement, but we must rest. We've got another day of fishing ahead of us along the same stretch of river. As the sun slips from sight, we eat dinner. After supper, we adjourn to the porch’s edge to give our interpretation of the day's adventure. Midnight falls, and we're still talking. While Bubba talks of rapids and such, I stare into the sky and squint to make out a faint satellite as it drifts overhead. My mind drifts away from the conversation as I quietly contemplate. The stars seem a lot brighter tonight. Sackcloth described the sky’s blackness last night, but tonight, I am simply in awe with the region and descriptors escape me. This trip down the Devils has me enchanted.